Over the past few days I’ve been thinking a lot about Amerindian featherwork and colonialism. Probably the best-known examples of featherwork are the “feather paintings” produced by Nahua featherworkers (who were called amanteca). The Aztecs, a branch of the Nahua people, used featherwork for a wide range of prestigious items, including tapestries for their palaces, capes, and head crests. Along these lines, Europeans also were fascinated with feather paintings, not only for their technical skill, but apparently for their delicacy.3 I think that this idea of delicacy and fragility is very interesting, given the context of colonialism. With the European mindset of conquering the Amerindians (in terms of politics, culture, and religion), it doesn’t seem surprising that the Europeans would be drawn to imagery that reinforces the delicacy and fragility (in other words, the weakness) of the Amerindians. And I think it is especially interesting that the this idea of fragility is not necessarily embodied in the subject matter for the imagery, but in the artistic medium itself. In fact, the act of collecting featherwork also can be connected to the conquering mindset of Europeans and colonists. One can argue that Europeans were able to “own” or “control” Amerindians through the collection and ownership of feather art. 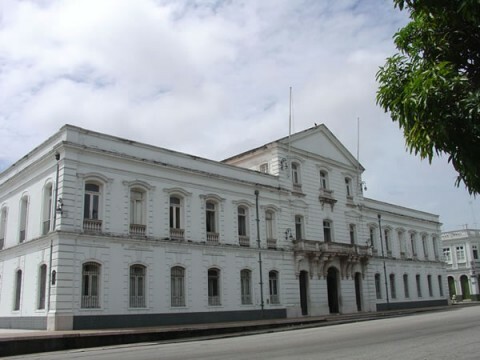 Works of art can be transported, manipulated, bought, contained (think of the Cabinet of Curiosities in the 16th and 17th centuries), and sold – similar to how the Amerindians were treated by various European groups. 4 Edward J. Sullivan, “Indigenous Cultures,” in Brazil: Body and Soul (New York: The Solomon R. Guggenheim Foundation, 2001), 78. Image credit: Public domain image via Wikipedia. During the 17th-19th centuries, colonization and global expansion were growing trends in European culture. Although many Europeans enjoyed the benefits of colonization through imported goods (you do realize that British tea originally came from China, right? ), most people would never travel to the exotic, faraway colonies that were claimed by their native countries. Instead, it is apparent that many people turned to fine art and the decorative arts as a way to visualize and experience the exotic. Really, the European view of what constituted “the exotic” was rather distorted from what the actual colonies were like. Travel accounts were a popular way for Europeans to learn about faraway lands, but the writers of these accounts often mythicized their subject matter, in order to make the story more interesting and marketable. So, it can be argued that “the exotic” is really a European construct. Artists appealed to the interest in this construct by painting “exotic” subject matter. It’s interesting to look at colonial art from this period, and see how it enables Europeans to experience the exotic (or, in truth, what Europeans perceived as exotic). 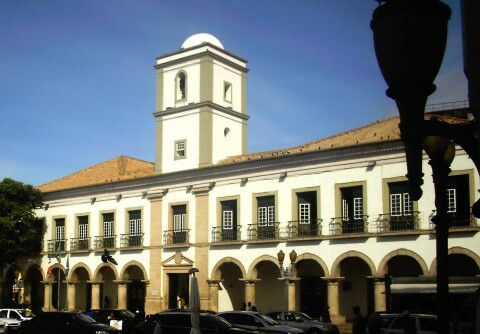 After leaving Brazil, Post continued to paint Brazilian landscapes. However, these later landscapes are not accurate or true-to-life depictions like Post’s earlier works. Instead, these paintings are more imaginary and fantastic, which likely was due to the European demand for mysterious and exciting subject matter in exotic art. 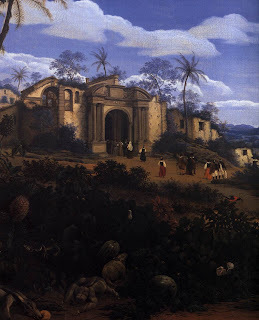 You can see Post’s exotic elaborations in the detail of the painting, View of Olinda, Brazil(1662, shown above). Next to the tropical plants, Post includes a sloth, monkey, armadillo, anteater, and a lizard. There is no way that all these animals would realistically appear together, outside of their natural habitats. I think, though, that Post is using this artistic liberty as an enabling mechanism, so that the viewer can experience a saturated “exotic” experience. Interestingly, Post also used much brighter colors in his later landscapes of Brazil, which can tie into this stress on exoticism, since the bright colors could emphasize a striking contrast between the exotic world and Europe. 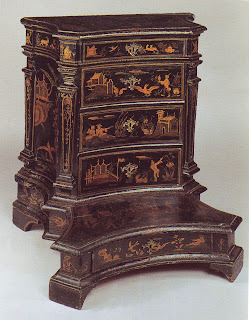 I really like how some European religious furniture was decorated with chinoiserie (a Western European style that contained Eastern artistic elements). I think that chinoiserie can be viewed as an enabler for a Western worshiper to have an exotic (and more religious) experience. This Roman prie-dieu (18th century, shown above) is a kneeling bench that was intended for prayer. It is decorated with gilded chinoiserie designs on a dark green background. Even the top of the prie-dieuboard is decorated in chinoiserie. Therefore, when a prayerful worshiper approached this piece, kneeling down onto the design, it would be as if he was placing himself within the chinoiserie landscape. In other words, due to the paradisaical connotations with the East, the worshiper could kneel and place himself in the exotic, celestial realm of God for the duration of his prayer. 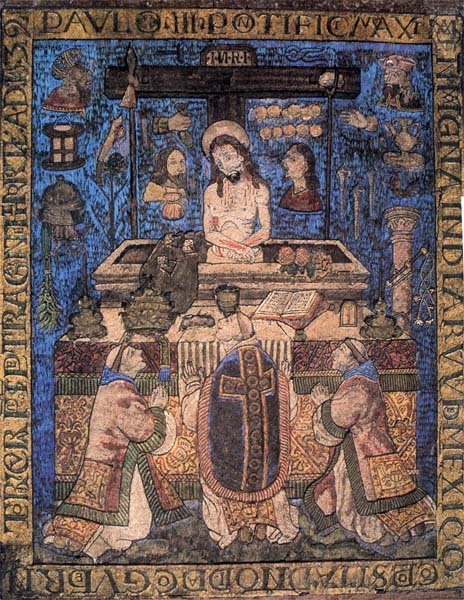 This association and transcendent experience could heighten the religious experience for the European worshiper, who could feel a more intimate connection with God while temporarily abiding in His heavenly environs.Can you think of a better way for art to enable one to experience the exotic, than to invite the viewer to kneel and physically enter the exotic realm? I think this prie-dieu is awesome. Interest in “the exotic” continued into the 19th century. Some painters, such as Delacroix, were interested in exotic subject matter of the East. Their paintings and interests created the movement Orientalism, a French facet of Romanticism. There is so much to say about this subject (for example, Linda Nochlin’s feminist interpretation of Orientalist art is fascinating! 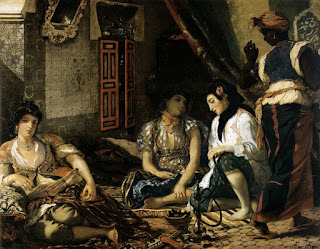 ), but I just want to mention one thing in regards to technique.3 I think it’s interesting that Delacroix uses a painterly approach in his exotic painting, Women of Algiers (1834, shown left). It has been noted that, because of this tactile technique, Delacroix’s figures are “redolent of the exotic, perfumed, and drugged harem atmosphere.”4 I think that this is an interesting approach to enable the viewer to experience the exotic; Delacroix renders the paint to be tactile and visually-available, which perhaps makes the exotic experience seem within-reach of the viewer. What do you think of “the exotic” construct and its manifestation in art? I wonder if such an exaggerated and incorrect view of a country (or culture) could exist today, since photographs and films are readily accessible to help one experience or learn about a faraway country. What do you think? 1 Edward J. Sullivan, ed., Brazil: Body and Soul (New York: Guggenheim Museum Publications, 2003), 69. 2 Hugh Honor, Chinoiserie: The Vision of Cathay, (London: John Murray Publishers, Ltd., 1961), 4-6. 3 See Linda Nochlin, “The Imaginary Orient,” in Politics of Vision: Essays on Nineteenth-Century Art and Society (New York: Harper & Row, 1989), 33-59. 4 Laurie Schneider Adams, A Western History of Art (New York: Harry N. Abrams, Inc., 1994), 356.